Hailed by Time Out as a ‘rising star of the baroque violin’, American-born violinist Persephone Gibbs studied with Dorothy DeLay at Juilliard, gained degrees in English at Yale and Law at Columbia, improvised with a rock band for a year and immersed herself in dancing tango before moving to London to study with David Takeno and Rachel Podger at the Guildhall School of Music. Persephone leads, solos with, and occasionally directs the Brandenburg Baroque Soloists, Charivari Agreable Simfonie and the Temple Players. She led Opera Theatre Company‘s productions of Orlando (2009) and Alcina (2010) at the Buxton Festival. Other soloist and guest leader appearances include the Festive Orchestra of London and the Orchestra da Camera Lorenzo Da Ponte. 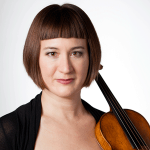 Persephone co-founded baroque chamber group Gut Instinct, which explores music for two or three violins and continuo. She has appeared in chamber concerts with the Gabrieli Consort and Florilegium, and her interest in early Italian repertoire has led to single-string work with His Majesty’s Sagbutts and Cornetts, the English Cornett and Sackbut Ensemble and I Fagiolini. Persephone is a member of the Academy of Ancient Music, the Orchestra of the Age of Enlightenment and the Gabrieli Consort, and plays frequently with the Amsterdam Baroque Orchestra.